Jackie’s story was first told in a video released in 2014. She was diagnosed with systemic lupus at the age of 21. This incurable autoimmune disease attacked her body, especially her kidneys, and no medication could bring her relief. She endured years of physical suffering, but for her the most difficult aspect of her illness was the likelihood that she and her husband, Brian, could not have children. Motherhood was Jackie’s lifelong dream, but even after becoming pregnant she lost her baby due to complications from her disease. Jackie’s rheumatologist suggested she look into the work being done by Dr. Richard Burt at the Northwestern University School of Medicine in Chicago, who had success in using adult stem cell transplants to treat a variety of autoimmune diseases. Jackie and Brian decided she would receive the treatments as a last resort. The procedure began with the harvesting and storage of her own bone marrow adult stem cells, followed by five days of intense chemotherapy to rid her body of the rogue autoimmune cells causing her lupus. Then Jackie’s stored adult stem cells were injected back into her body, to start a fresh immune system that would not attack her own organs. Within months, Jackie began to feel better, regain her strength and health, and thoughts of motherhood were again on the horizon. It’s now been seven years since her adult stem cell treatment, and Jackie and Brian couldn’t be happier. Jackie is vibrant, healthy, and lupus-free. She’s also extremely active, especially in chasing after her two little girls, Tenley and Taryn.“Adult stem cells saved my life, gave me a chance to have a life, gave me that chance to be a mom,” says Jackie. She says given the chance, she would do it all over again. “Adult stem cells saved my life, gave me a chance to have a life, gave me that chance to be a mom,” says Jackie. She says given the chance, she would do it all over again. Many others like Jackie are currently being treated using ethically-derived, non-controversial adult stem cell transplants, which do not require the destruction of young human life. Adult stem cells are the gold standard of stem cells when it comes to patients. Well over one million patients worldwide have been treated using adult stem cell transplants. In 2014 alone, nearly 20,000 bone marrow and umbilical cord blood transplants were performed in the United States, according to the federal Health Resources and Services Administration’s Blood Cell Transplant Report. Stem Cell Research Facts is a project of the Charlotte Lozier Institute since January 2015. 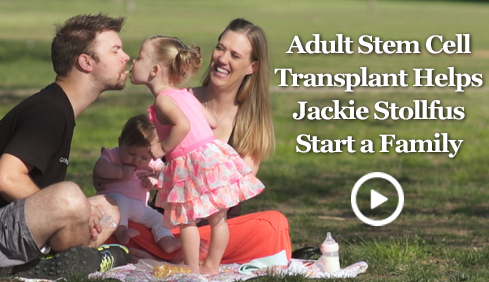 CLI plans to continue producing inspiring videos like Jackie’s to raise awareness about the life-saving, science-based, and ethical treatment option of adult stem cell transplants. Don’t miss the opportunity to view the entire series – and tell your friends, some of whom may someday benefit from these astonishing therapies.